Ha, I remember this day like it was just last month. 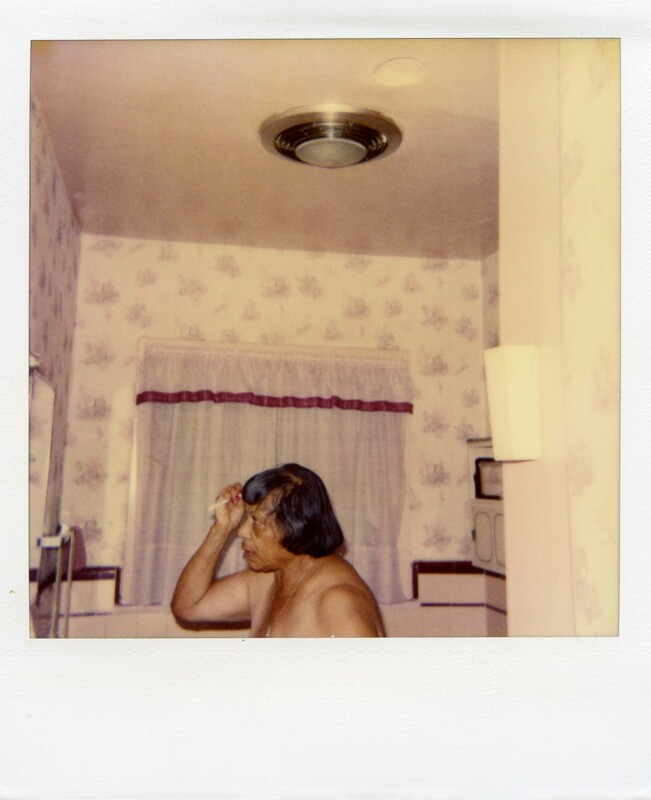 That’s George, combing his hair in my aunt’s bathroom. He had lost his sister a few weeks before, he’d been totally inconsolable, convulsing and incapable of being alone. He knew my aunt from bowling, she took him in. She was great at keeping him from ruminating, kept him happy, kept him bowling. He knew it was a distraction but he played along. It was good to see him embrace it. Can you see that in his eyes here? This was the day their bowling team, Red Fingers — they always wore red nail polish — was up against their arch-rivals, The Diego Dusters, in the finals of the alley’s championship. They had never made it this far in any competition before. George was so giddy, I’d never seen a bowling ball roll down the alley with such tremor. He missed a few but landed more strikes than anyone else. That night, he kissed his silver trophy and left with his shoulders back and chest out, ready to display it in his bedroom, content at home again. A few months ago I caught him eating bugles at the laundromat. He’s grown a little haggard but he still keeps those nails red, even though they were textured by that tangerine dust. The tips of his hair were all still a little red from when he dyed it after my aunt passed last year. His old crew has just one member left. The rest have gone, moved to find work or died too. George tells me he keeps bowling. On days that he’s broke he lines up his empty beer bottles in the alleyway out back and at them rolls the bowling ball I got for his 75th, colored with swirls of black, brown and red and inscribed with his sister’s name. It’s already scratched up like a cheap old blackboard.